Master watchmaker Franz Wolff (Lottermann & S?É¬?hne) created the Crazy Planet. 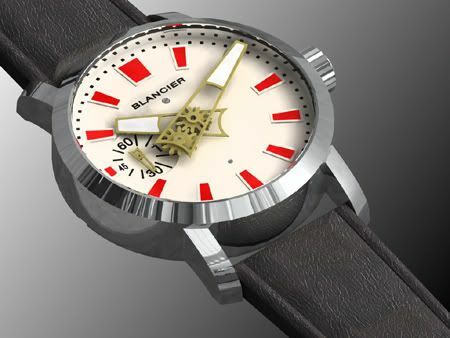 With ?¢Ç¨?ìCrazy Planet?¢Ç¨¬ù – developed and produced entirely in house – Blancier is once again introducing a watch of unparalleled world class. The most important wheels of the Crazy Planet are laid out in a planet orbit formation. In normal mechanical watches, all wheels are invisible, hidden under the watch face. Blancier has made wheels visible by displaying the workings on top of the watch face. This Tourbillon-like design, in which wheels have actually been incorporated into the hands, makes Crazy Planet not only technically impressive but also aesthetically attractive.